The village of Comala, Mexico, about 10 miles (16 km) outside of the city of Colima, the capital of tiny Colima state, is home to a unique drinking tradition. 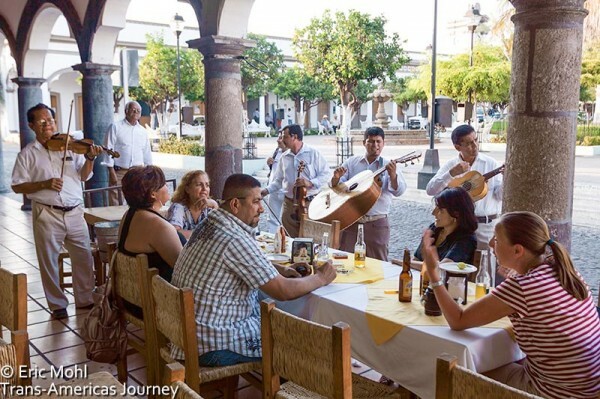 While every Mexican city, town and village has at least one plaza with at least one bar on it, in Comala, named a Pueblo Magico in 2002, you’ll find a plaza ringed with open air bars tucked into atmospheric portales. These bars offer endless plates of tasty snacks that come free as long as you keep ordering their (slightly pricier) drinks. Gaze at the very active 12,533 foot (3,820 meter) Colima Volcano as it spews and sputters in the distance as the cold beers, tequila shots, tacos and mariachis just keep coming. If you over do it at the bars on the square in Comala, take advantage of a local morning after remedy. It’s called leche caliente and it involves an early morning trip to a dairy farm armed with cups, alcohol (the plastic bottle containing the clear hooch will simply say “alcohol”) and a mix of ground up chocolate and sugar. Somehow you end up with this, a Comala Leche Volcano. Once you’ve recovered, don’t miss Nevado de Colima National Park where you can hike, go birdwatching or even climb the Colima Volcano if it’s not too active. Mexico Location: Where is Colima, Mexico? Colima is one of the smaller states and located on Mexico’s Pacific Coast between Jalisco to the north and Michoacan to the south. Also, the state is home to the four Revillagigedo Islands, oceanic islands far off the coast of Mexico. Also, despite being small and the state with the lowest population, it apparently offers one of the highest standards of living in Mexico. Love that they have the drinks and the hangover cure so you can still experience the beauty of the place. Looks like another great adventure in Mexico. Thanks for taking us along Craig! Yes, it is funny how that works…. and certianly plenty to drink in Mexico. As for taking us along, well, I am planning to take people along this April 30th with Stay AdvenTOURs to Mexico City.